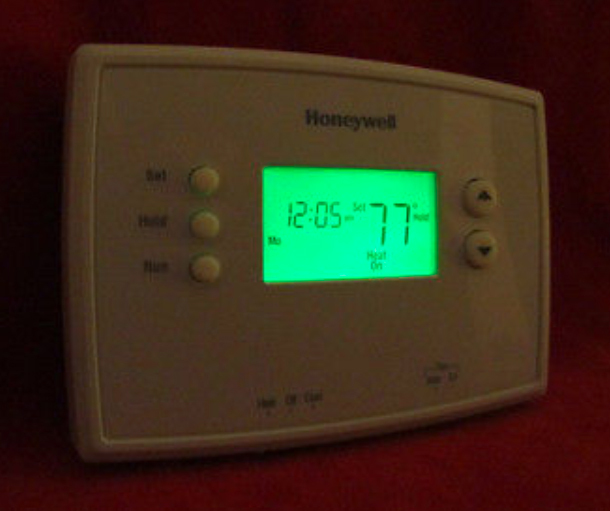 The pipes in any unheated part of your home or business are at risk for freezing in cold weather (i.e. attics, crawlspaces, wall voids). If you have lines that are prone to freezing make sure you have valves installed on those lines so you can shut them off immediately. This will save you from a more expensive emergency service call and greater damage. Why is this important? When the water in a pipe freezes, it creates a pressure of up to 2,000 lbs/square inch, causing a rupture that can create a sudden stream of over 100 gallons/hour flooding into your home or business. By the time the plumber arrives you could easily have a damage estimate of well over one thousand dollars. 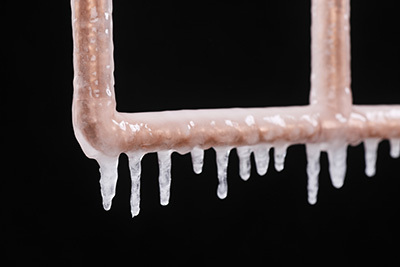 This brings to mind a second precaution: Make sure your home’s insurance policy adequately covers frozen pipe damage. How do you know the pipe is frozen? If you have a frozen pipe, you may hear bubbling, whistling, banging or clanking sounds when you turn on the water or flush the toilet. There may be sewage odor emitting from a drain, sink or toilet–especially on the ground or basement levels of the building. You may experience a mysterious drop in water pressure. Wet drywall in a location other than immediately below the roof is a burst or leaky pipe warning. 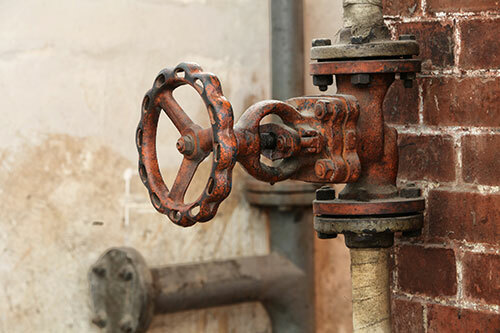 Definitely, some dead giveaways are frost or ice on pipes, or pipes that are misshapen or bulging. So you’ve got a frozen pipe, what do you do? First, locate and isolate the frozen pipe. Trace the pipe backward from the faucet that has low pressure. If you are successful in isolating the frozen pipe, shut off that line. If you can’t isolate the line, it may be wise to turn off the water to the entire building. Second, open the faucet and let the water fully drain out of the pipe. This may help relieve pressure in the system. Third, if you are able to locate the frozen portion of the pipe and verify that it is not broken, you my gradually heat the pipe by using a hair dryer, warm towel or other method. If you catch it soon enough you can save a burst pipe. One sign of success is that proper water pressure is restored when the water is turned on again. However, before turning the water back on, you must be absolutely sure that the pipe is undamaged. Note, if there are bubbling sounds or other signs indicated above the pipe may be burst, so you’ll need to take additional precautions to protect your property before heating the pipe. Heating a burst pipe could result in additional water damage so you’ll want to ensure the additional leakage is captured. If the pipe is in a location that is not accessible, and you aren’t sure whether the pipe is burst, it’s best to call in the professionals. The Plumbing Artisans have the equipment to run an electric charge on the pipe (copper pipes), heating it up so that the ice will melt. If the pipe is pvc or pex and is in an inaccessible area, the plumbing artisans may need to create a small hole in the wall to get to the pipe and thaw it out. Properly thawing out a good pipe can save the pipe from bursting. The key to getting the pipes thawed is keeping the heat up in the house so more pipes don’t freeze and the frozen ones don’t burst. If the frozen pipe is a heating pipe, we use the same procedures but the frozen pipe is much harder to find, not impossible but much harder. So if you have one of these issues this year don’t hesitate call your friendly neighborhood Plumbing Artisans. Proper insulation of “at risk” pipes, and heating the areas around those pipes: This might include precautions as simple as never letting the house temperature drop below 55-60 degrees, even when you’re away on vacation. You might also keep the cabinet doors under your sink open during cold weather. Additionally, you could leave the faucets in “at risk” areas open to a slow drip during cold snaps.